The genesis of the square is more complicated than the cross, because it involves two pairs of parallel lines crossing each other perpendicular, to delimit an area. The ‘home base’ for the square or rectangular design is, from a mental-genetic point of view, in the Third Quadrant. This situation of ‘squareness’ implies, above anything else, a static character of its meaning. Boundaries are fixed, measurements can be taken and a scale might be established in comparisons, but this visible identity also limits its dynamism. Something which is, is not something else (at least not in the type of lower division thinking). Any building, which follows a square of a rectangular ground plan, transcends the visible visibility of a quadrant (III) into a communication. This visibility comprises – in a quadralectic point of view – only one quarter of the specter between the observer and the observed. The number of corners also points to three other types of visibility, which are present in higher division thinking, i.e. the invisible invisibility of the First Quadrant (I), the invisibility visibility of the Second Quadrant (II) and the visible invisibility of the Fourth Quadrant (IV). The old Egyptians believed, in particular in the latter part of their cultural presence and the following Ptolemean period, in the ‘Four Corners of the Earth’ as a symbolic representation of the world. Sir William Flinders Petrie (1853 – 1942) discovered the city of Naukratis in 1884 and with it some interesting insights in the ceremonial aspects of the four corners of a building. The long-lost city was situated at the western frontier-line of the Nile delta, halfway between Alexandria and Cairo. He found initially so many Greek figured ware that ‘it was like walking through the smashings of the vase-room of the British Museum’ (EDWARDS, 1891). Naukratis was founded by Milesian colonists and granted special privileges by Amasis II (also known as Khnemibre; 570 – 526 BC) of the Twenty-Six Egyptian Dynasty (664 – 525). The end of this dynasty and the beginning of the First Persian Period (Cambyses II) has often been marked as the start of the Late Period. The end of the ‘pure’ visibility of the Egyptian cultural period was placed around the year 500 BC (see fig. 58). The city of Naukratis was renowned at the time of Herodotus (of Halicarnassus, fifth century BC) for the skill of its potters. Furthermore, the manufacturing of amulets, sacred emblems, toys, seals and beads was well developed. Petrie found in an old workshop hundreds of scarabs, the symbol of the holy beetle. Amelia Blanford Edwards (1891; Chapter 1, p. 29) noted that ‘we have long known that the early Greek, when emerging from prehistoric barbarism, must have gone to school to the Delta and the Valley of the Nile, not only for his first lessons in letters and science, but also for his earliest notions of architecture and the arts. Now, however, for the first time, we are placed in the possession of direct evidence of these facts. We see the process of teaching on the part of the elder nation, and of learning on the part of the younger. Every link in the chain, which connects the ceramic art of Greece with the ceramic art of Egypt, is displayed before our eyes in the potsherds of Naukratis’. The most important discovery (by Flinders Petrie) – in the light of our present investigation – consisted of ceremonial deposits buried under the four corners of a building adjoining the Pan-Hellenian (‘The Hellenium’) in Naukratis. The latter building was a project conjointly executed by Ionians, Dorians and Aeolians. The building investigated by Petrie was of a later age, presumably initiated by Ptolemy Philadelphus (Ptolemy II), who lived between 308 – 246 BC. Petrie found masonic deposits of the royal builder under the four corners of the gateway of this building. Under each corner laid a series of diminutive models in a specially prepared hole. The objects consisted of models of tools (rake, adze, chisel, etc.) and four little alabaster pegs. These implements were models of those used to mark out the four corners of the building. Furthermore, many articles used in the masonic ceremony and samples of materials (small plaques of lapis lazuli, agate, turquoise, etc. and minute ingots of iron, copper, lead, silver and gold) were found. Most of these objects are now in the British Museum. Edwards (1891; p. 33) remarked that ‘this was the first discovery of masonic deposits ever made in Egypt, and it marks an entirely new departure in the field of exploration’. These deposits were later (1886) also found in Tell Nebesheh (under a temple built by Amasis II in the city of Am) and under a ruined temple at Tell Gemayemi. Nowadays, this celebration of the symbolic meaning of the ‘Four Corners’ is no longer practiced in architecture. In fact, the square/rectangular outlay is so common, that its spiritual message – of pointing to a tetradic world view – is virtually lost. The search for any specific ‘quadralectic architecture’ in such a ground plan is, for this very reason, a difficult one. On the one hand, it can be defended that all square/rectangular plans are ‘quadralectic’ and belong to a tetradic communication like it was celebrated by the later Egyptians. On the other hand, almost none of them qualify as ‘typical’ examples, due to their lack of expression. This dilemma has to be faced. In the end, it should be remembered that the square/rectangular building, despite its common and time-less appearance, plays a crucial role in the history of architecture. Some of the more eye-catching examples are given here to prove the point. The first rectangular churches were of the so-called basilica type. The oriental basilica originated in Mesopotamia (DAVIES, 1952; p. 48) and found its way through Armenia and Anatolia to Cyprus, Crete and Greece. From there on it spread all over Western Europe and perpetuated to do so for over a thousand years. The occurrence in the East ceased after the fifth century AD, when churches of the central type ousted it. The roof of the earlier basilica was vaulted and not made of timber. The vaulted roof, supported by piers was characteristic of an Asiatic origin, and can be found in Persia, Mesopotamia and Syria. The Romans constructed basilica type buildings as early as 184 BC (as recorded by the elder Cato). Their function was similar to a modern public office, as a designated place for transacting business and disposing of legal matters. The buildings catered for the multitude and the masses. Their form was rectangular with an interior colonnade, with an apse at one end or at each end. They resemble in a genetic sense a tetradic configuration, but it can never be proven that those intentions were present at the time of building. However, it can hardly be denied that the simple, square concept of a ‘box’ must have attracted the practical mind of the Romans. ‘We have no information on the failure rate’, said WHITE (1984), ‘but we must assume that, as with all processes of trial and error, it remained high, until stability was improved by strengthening either the foundations or the mortar, or by reducing the weight of the aggregates.’ The actual break-through of basilica building took place in the first centuries AD when the builders had discovered that two vaults could be made to intersect at right angles without losing stability (groined vaults). Only the piers at each of the four points of intersection could now support the roof. The basilica of Maxentius and Constantine (fig. 230) was the last of the great civilian and commercial buildings on the Roman Forum. The con-struction was initiated by Maxentius in 308 AD and finished by Constantine, after the latter had defeated the former at the Milvian Bridge in 312 AD. The entrance was at the east and towards the west was a huge apse (twenty meters diameter) where a colossal statue of Maxentius was situated. The remains of the statue were found in 1486. Fig. 230 – The basilica of Maxentius and Constantine (Basilica Constantini) in section (left) and its ground plan (right) was one of the masterpieces of Roman construction. The brick-faced concrete reached a thickness of six meters on the western side. The enormous height and span of the vaulted roof made it one of the most remarkable buildings in ancient Rome. Emperor Constantine had an entrance added to the south side on the Via Sacra. The remains of his colossal statue – even bigger than the one of Maxentius – were moved to the courtyard of the Palazzo dei Conservatori on the Campidoglio. The statue of Cosmocrater in the Museo Conservatori is still a momentous sign of bad taste and megalomania. Pope Paul V removed one of the columns in 1613 to the Piazza di S. Maria Maggiore, where it forms a pendant with the Lateran obelisk at the other end of the Via Merulana. Many (pagan) temples of the basilica type were built in Syria in the first and second century AD. The tetradic concept of temple building was further pioneered from the middle of the third century AD onwards. The design with towers at the corners of the roof became a noteworthy feature. The little temple at Djmer (fig. 231) and also the Great Temple of Bel at Palmyra have staircases at either end of the cella, presumably leading to towers. The Temple of Bel dates from around 32 AD and was built during the reign of Tiberius, although some of the decorations might be of a later date (second and third century AD) and have a Hellenistic character. Fig. 231 – The temple at Djmer (Syria), consecrated in 245 AD, was dedicated to Zeus. Unlike the Greek temples, it had towers at all four corners of its gabled roof. The temple embodied the idea of a place of worship, a palace precinct, a defensive work and a city-gate in one and became an architectural guideline for times to come. The basilica consisted of a single room – as a symbol of (un) divided unity – in which the worship took place and people gathered around a common altar (fig. 232). The word basilica, which originally referred to something ‘kingly’ or ‘lordly’ and suggested a grandeur of proportion, became a synonym for dominicum (house of the Lord). ‘It is not surprising’, wrote BALDWIN SMITH (1956; p. 15), ‘that the Christian towards the close of the fourth century began to think of their ecclesia as a royal structure, which they called ‘basilica’. It was only about a century later that the Christians transformed their places of worship into a royal Domus Dei. The Basilica in Leptis Magna in Libya, which is now ruined, is a good example of an imperial basilica, serving for a variety of civic purposes. The building had a long nave, terminating in a semicircular niche (or apse). A colonnade gave support to the wooden ceiling and divided the side aisles. The early Christian basilica was, according to JANSON (1962/1986; p. 200), a synthesis of an assembly hall, temple and private house. There were gradual changes away from the (older) pagan basilicas: the entrance doors moved from the sides to the western end and the altar became the new focus. The layout of the Christian basilica centred around a longitudinal East-West axis, like some of the Egyptian temples (in Luxor). 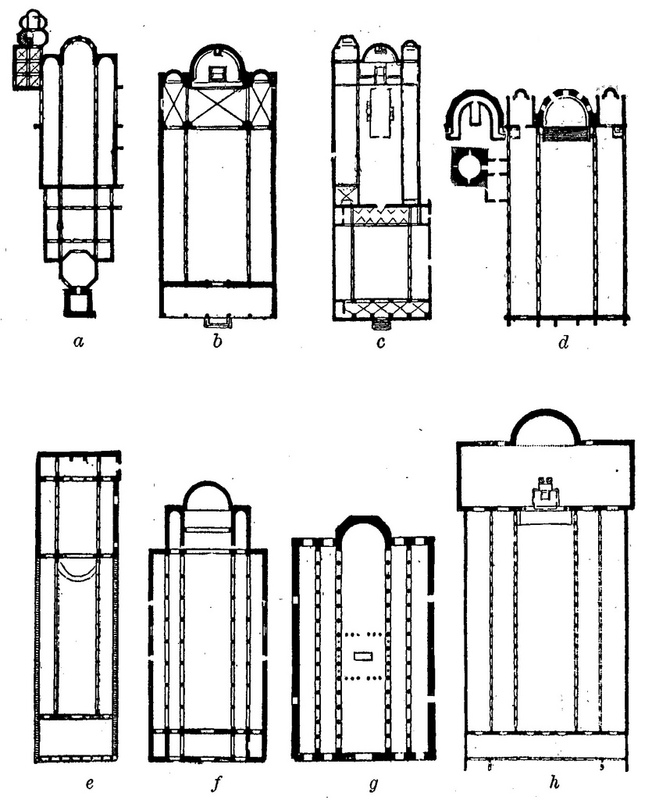 Walter LOWRIE (1906) gave an overview of the characteristics, origin and the classical forms of a number of basilicas (fig. 232). Fig. 232 – A number of early basilicas in the Roman Empire and Middle East as given by Walter LOWRIE (1906) to indicate the variety of divisions and extensions. The explanations of the letters are as follows: a. Cathedral of Parenzo; b. S. Pietro in Vincoli, Rome; c. S. Clemente, Rome; d. S. Apollinare in Classe; e. S. Lorenzo, Rome; f. Basilica in Suweda, Syria; g. Basilica Ursiana, Ravenna; h. S. Paul’s, Rome. 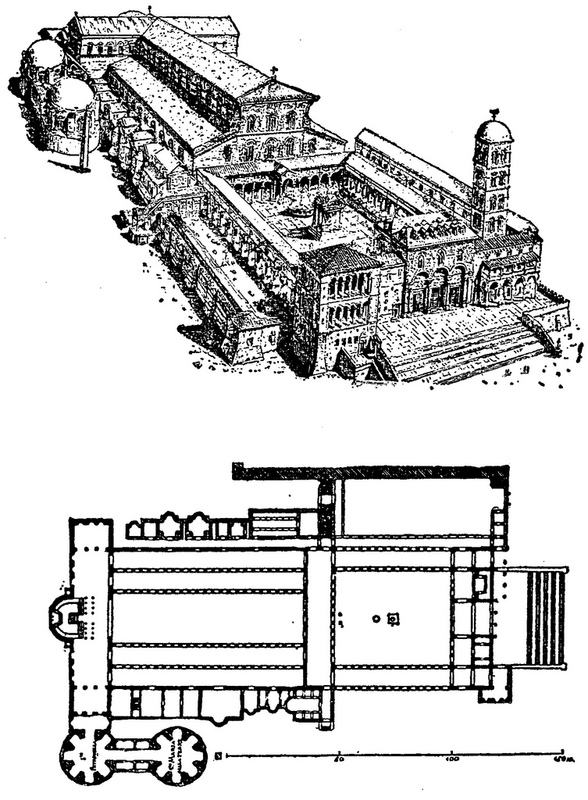 Two principal divisions marked the basilica: the great rectangular hall, destined for the laity, and the apse, in use by the clergy. The western side was called the narthex and was separated from the nave by a low wall or screen. Here the catechumens and penitents, who were not admitted among the congregation, were gathered. The narthex consisted of an exterior and an interior part. The exterior type was the atrium, opening up to a free space in front of the church. This quadrangular court was sometimes surrounded on all four sides by porticos, hence the name quadriporticus. The room of the congregation was divided by an even number of colonnades, resulting in an odd number (either three or five) of aisles. The five-aisle system was rare and only adapted in the greater basilicas (like the old St. Peter’s, fig. 233). Fig. 233 – A plan and drawing of the old basilica of S. Peter’s in Rome (Basilica of Constantine) displays the initial five naves and four rows of twenty-two columns each. Emperor Constantine started the building in 323 AD and the church functioned for some twelve centuries before demolition and rebuilding started during the Early Renaissance under Pope Nicholas V. After his death in 1450 the plan was changed again by Pope Julius II at the beginning of the sixteenth century (1503). The new S. Peter was not a basilica anymore and saw Bramante, Michelangelo and Giacomo della Porta as its main architects. Egypt has a long and well-documented architectural history, but their real glory was long gone after the Greek and Roman occupation. Alexander the Great had marched into Egypt in 332 BC and defeated the Persian ruler Darius III Codomannus. The Ptolemean Dynasty took over after the death of Alexander the Great (Ptolemeus I Soter), until they were defeated in turn by the Romans (Octavianus) in the battle of Actium in 31 BC. These events are left out of the unity of the Egyptian cultural period proper, mainly because they were inflicted from the outside by occupational forces. The present period of significance (in the light of their tetradic inspiration) is situated in the first ages of the Christian calendar, roughly from the first to the sixth century AD. The city of Alexandria was in that period a thriving commercial center with cosmopolitan aspects. The city became a haven for all kinds of new beliefs. The major players on the scene were Gnostics, Judaism, and newly developing Christianity – with the Coptic Church as their main representative – and other minor sects. The beginnings of Gnosticism are a matter of debate, but it seems that the initial faith was considerably older than Christianity. There might have been an eastern origin, with lines running to Syria and Phoenicia or with a connection to Mazdeism. Gnosticism can also be regarded as an authentic Egyptian creed, based on the remains of their own long-standing (religious) convictions. It is known, for instance, that tetradic ideas were common knowledge during the Ptolemaic times. The motif of the four corners of the earth, the architecture of temples (like the temple of Sobek at Kom Ombo; see fig. 71) and the symbolism of the four-headed rams at Dendera (fig. 72) point to a preference for the four-fold. This historical background could have contributed to the Gnostic way of thinking. Fig. 234 – The different types of division thinking at the eastern fringes of the Mediterranean are placed here in the Third Quadrant of the Roman cultural period (375 BC – AD 125). Alexandria was, in the first centuries AD, the ‘battlefield’ of division thinking. One (the Monotheism of Judaism), two (the dualism of Mithraism), three (the Trinity of Christianity) and four (Gnosticism?) divisions were ‘fighting’ for supremacy. A study of the various approaches in the light of their initial type of division thinking has never been performed, but it would certainly give a deeper insight in their intentions and objectives. It is curious to note that Coptic Christianity, for instance, attacked Gnosticism, because of its dualistic tendencies. However, such allegations could only arise by people, who were unable to outgrow their own limited type of division thinking. The Gnostics – in their presumed higher type of division thinking – had no need to defend themselves: they knew and were aware of the restrictions of their opponents dualistic outlook. A wider mental setting, pointing to some sort of Fourth Quadrant, provided the breeding ground for the intellectual and spiritual encounters in the Nile Delta. 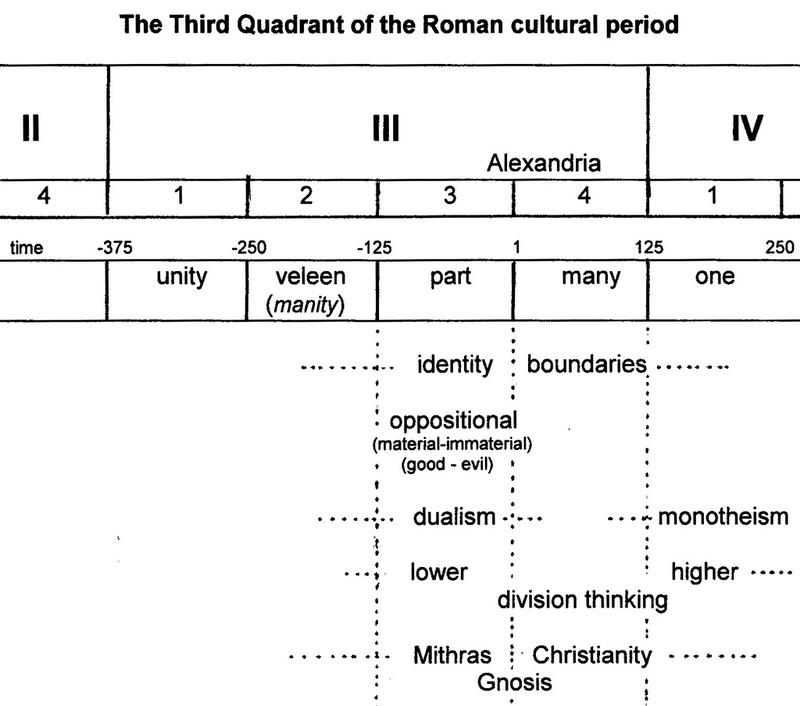 Alexandria’s position of prominence within the Roman cultural period can be placed in the fourth quarter of the Third Quadrant and the first quarter of the Fourth Quadrant (fig. 234). The interpretation of the universal communication-graph (CF-graph) implies that ‘everything’ becomes real and ‘visible’ around the marker line between the third and fourth part of the Third Quadrant. Even the fourfold way of thinking itself, with its natural reluctance against a public display, has to face its own presence at that particular position in the (universal) communication. Fig. 235 – Coptic textiles, with designs based on a P4-symmetry, might point to a preference of the tetradic. The architectural outcome of the religious, psychological and philosophical explorations by various groups was not directly evident in Egypt. However, the development of Coptic architecture found its roots and inspiration in this very intellectual turmoil. Coptic art is still characterized by a high degree of stylization, pointing to various forms of symmetry. 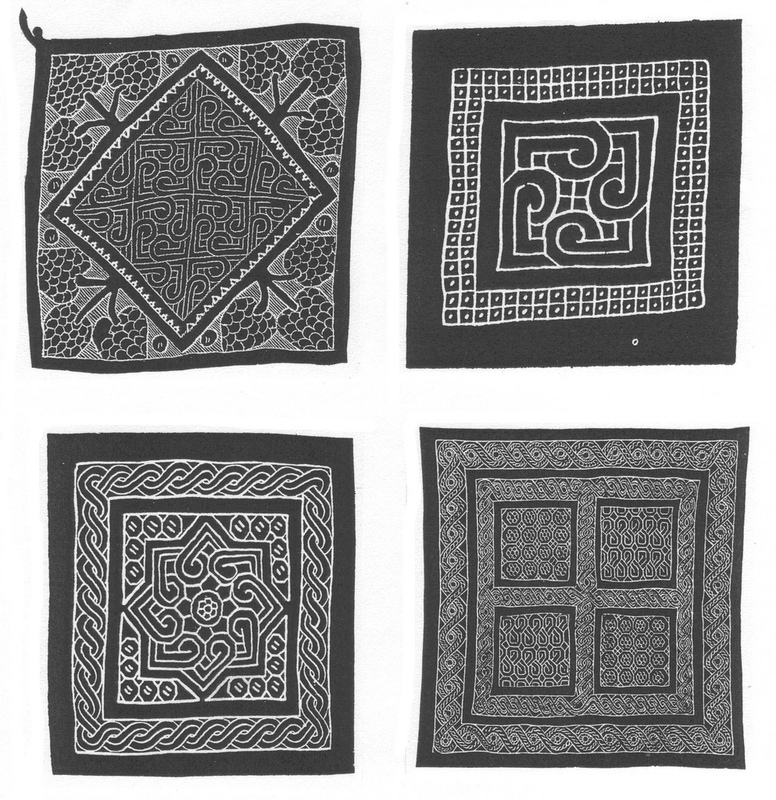 A great number of Coptic textiles, dating from the first ages AD and collected by Gaston Maspero in 1884, showed a variety of tetradic designs (GERSPACH, 1975) (fig. 235). Coptic architecture only reached its mature phase in the late fifth and early sixth century. 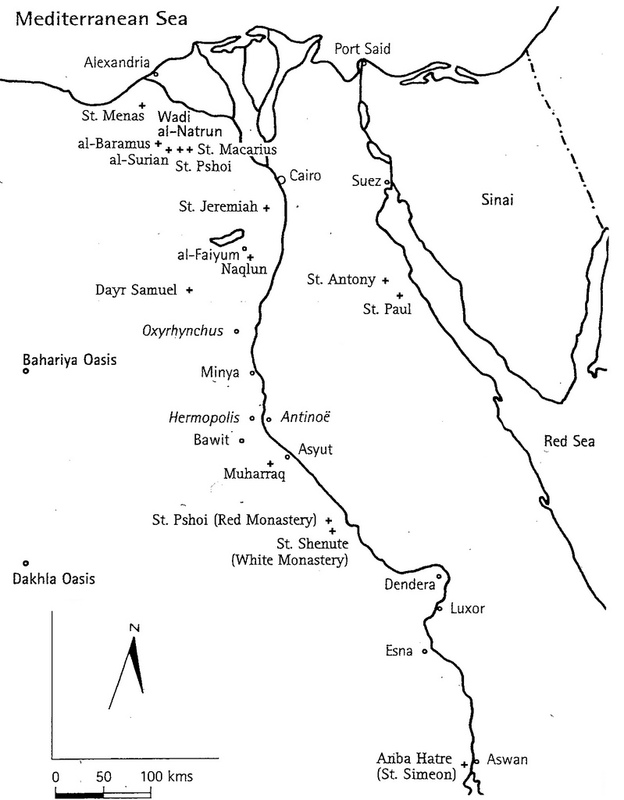 Good examples are the White (El Abiad) and Red (El Ahmar) Monasteries near Sohag in Upper Egypt (see fig. 236 for their locations and other Coptic monasteries in Egypt). Fig. 236 – The locations of the major Coptic Monasteries in Egypt as given by Gawdat GABRA (2002). The White Monastery, also called the Monastery of St. Shenouda (She-nute) the Archimandrite or the Monastery of Atribe, derived its name from the white limestone walls (fig. 237). It is situated eighth kilometers to the west of the city of Sohag. It is the most important Christian monument in Upper Egypt (GABRA, 2002). The nearby Red Monastery is built from red bricks and is also known as the Monastery of St. Pshoi (not to be confused with the monastery with the same name in Wadi al-Natrun in Lower Egypt). Fig. 237 – The Monastery of Atribe, or White Monastery, in the desert of Thebes was the seat of abbot Shenouda the Archimandrite (348 – 466) for more than 65 years. The building resembles a (late) Pharaonic temple and is built in a Basilica style. It had six entrances and the apsis is divided in three parts: the center section is dedicated to St. Shenouda, the southern one to the Holy Virgin and the northern section to St. George. A library was located in the monastery, but did not survive the onslaught of history. Its manuscripts are dispersed over the world. There must have been several thousands of monks and nuns in the Monastery of Atribe when St. Shenouda (348 – 466) became the abbot. He lived 118 years (!) of which he spent more than sixty-five years as an abbot of the White Monastery. The Coptic religious center remained active until the middle of the eighth century. During the eleventh and twelfth century, a group of Armenian monks decorated the central apse of the church. The Mamalukes finally destroyed much of the monastery in 1798 and only the church survived. The churches within the complexes of the White and Red Monasteries were an evolution from the old style basilica (CAPUANI, 1999). The architectural enrichments of the presbytery by three semi-circular apses introduced a new notion of division (triconch) within the former unity of the basilica. The symbolic meaning of the three-division (Father, Son and Holy Ghost) was the leading inspiration in this development (fig. 238, left). A separate architectonic development took place in the Nile Delta region south of Alexandria (Lower Egypt) in the sixth century AD. The Sanctuary of St. Menas started with a central plan with four semi-circular apses (tetraconch) (fig. 238, right). The tetraconch style might have been an expression of the tetradic way of thinking. Further attention to the various styles (of Coptic churches) in terms of their relation to division-thinking could be a useful exercise. It might support the suggestion, that the Coptic belief is a remnant of ancient Egyptian religious awareness – in which the four-fold played a role, which still have to be discovered. Fig. 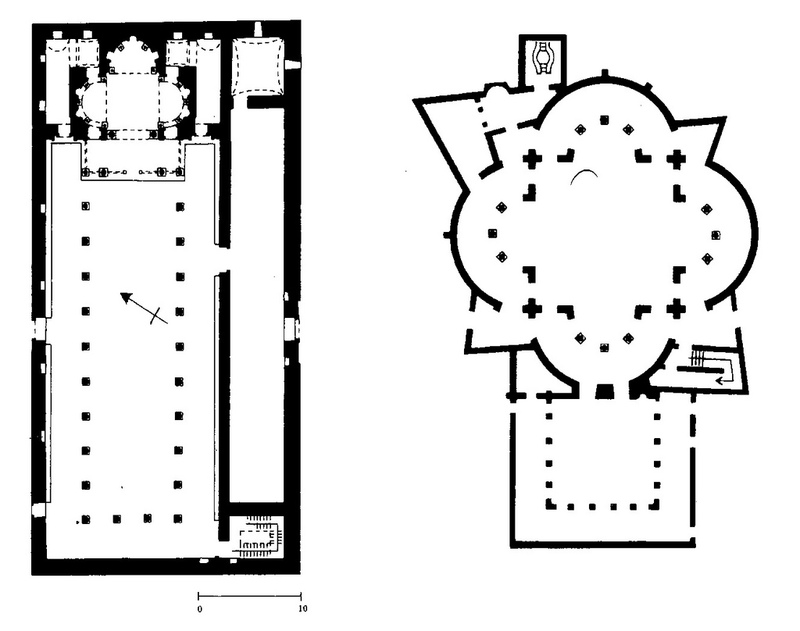 238 – Left: Original plan of the Red Monastery, dating from fifth century AD with its triconch structure within the outlines of a basilica. 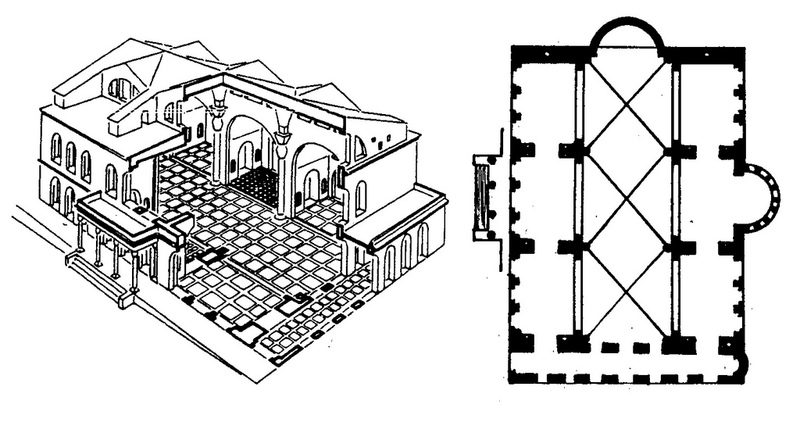 Right: A plan of the sanctuary of St. Menas (east basilica) built in the sixth century AD, with a tetraconch outline. The distribution of the basilica in Europe started around the same time as the monasteries in Egypt, i.e. the fifth century. 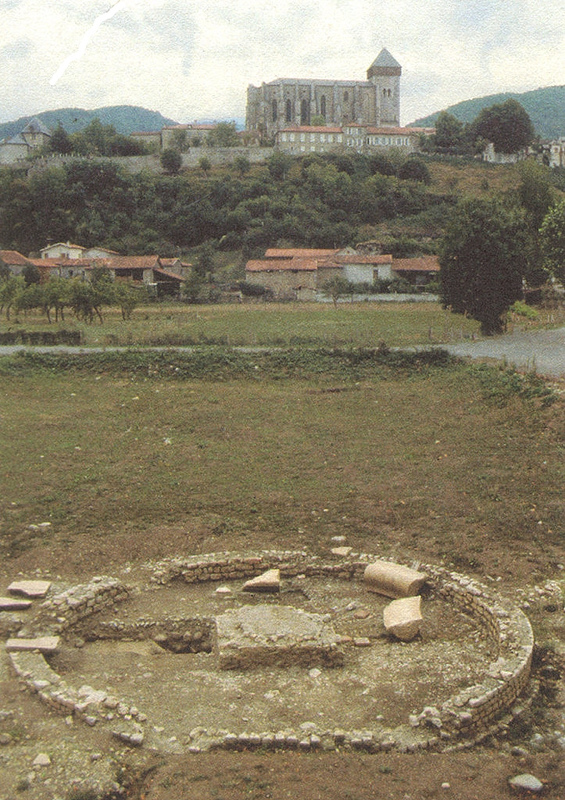 The oldest basilica in France (Gallia) – only known from its fundament – is in the Roman town of Lugdunum Convenarum (Saint-Bertrand-de-Comminges). This town in the Haute-Garonne was situated on the main axis of four Roman roads (Agen – Dax (Aquae) – Toulouse (Tolosa) – Spain) (below). The carre-four of roads at the Roman town of Lugdunum Convenarum (Saint-Bertrand-de-Comminges) (Photo in: SCHENCK-DAVID, Jean-Luc (?). Aux origines de Lugdunum: le monument à enceinte circulaire. Monuments et objects de Saint-Bertrand-de-Comminges. Musée archéologique départemental. A monument in the center of town still points to a crossing (carre-four, which literary means a square four), where the roads met (SCHENCK-DAVID). 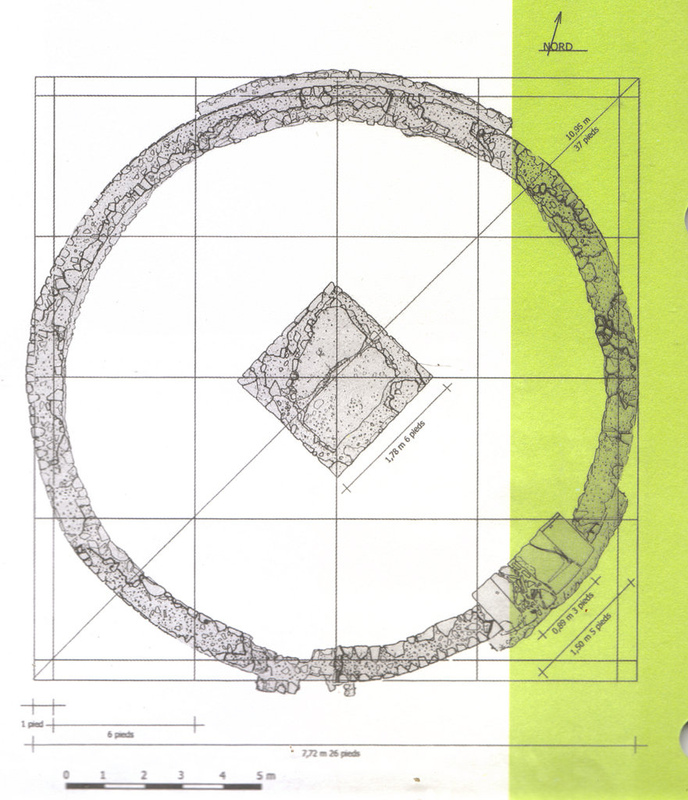 It is possible that the circular monument had a religious meaning and one can even speculate – because of the emphasis on the crossing – that a particular type of tetradic symbolism was involved. The geographical notions were ignored in 25 AD, when a temple was constructed and the Roman road from Dax was redirected. The round monument was placed on the crossing in order to please the gods. The findings of bovine bones near the square, dating from around 40 BC, suggested that some sort of market place (macellum) had previously existed here. The basilica of Saint-Bertrand-de-Comminges was probably built between 420 – 430 AD, starting with the chevet carré and continued in the second half of the fifth century with a narthex. Historians discover a number of sarcophagi of people, who were buried in the basilica around 700 AD. There are no sources available on the development of Christianity in Lugdunum between this date and the end of the eleventh century, when the building of the cathedral started. The interment within the church perimeter was also practiced at the Basilica of Saint Denis (Paris), which became in due course the famous burial site of the French monarchs. The abbey of Saint Denis was founded by Dagobert I, king of the Franks, who reigned from 628 to 637 and most of the members of the royal family are buried here (fig. 239a). The tombs were opened during the French Revolution – in one of the ugliest human behavior and in a true horror story style – and the bodies were removed and dumped in a mass grave nearby. After the Revolution (1817) the remains were placed in an ossuary in St. Denis’ crypt. The earliest basilicas in England find their roots in the large buildings created by the Romans during their occupation. Wroxeter, which was called Viriconium Cornoviorum at the time, was one of the largest Roman cities in the first century after the arrival of the Romans in Britain (in 43 AD). The city was situated on the so-called Watling Street, the main Roman road from Londinium (London) to Holyhead. Emperor Hadrian built a public bath in Viriconium as part of an extensive building program in the second century. The forum and the bath’s basilica were completed in 130 AD. The basilica acted as a seat of power for the tribal council, but also as a gathering place for the people. The bath and basilica were partly demolished in 527 AD and replaced by a new marketplace. A large wooden building replaced the basilica in 542. Fig. 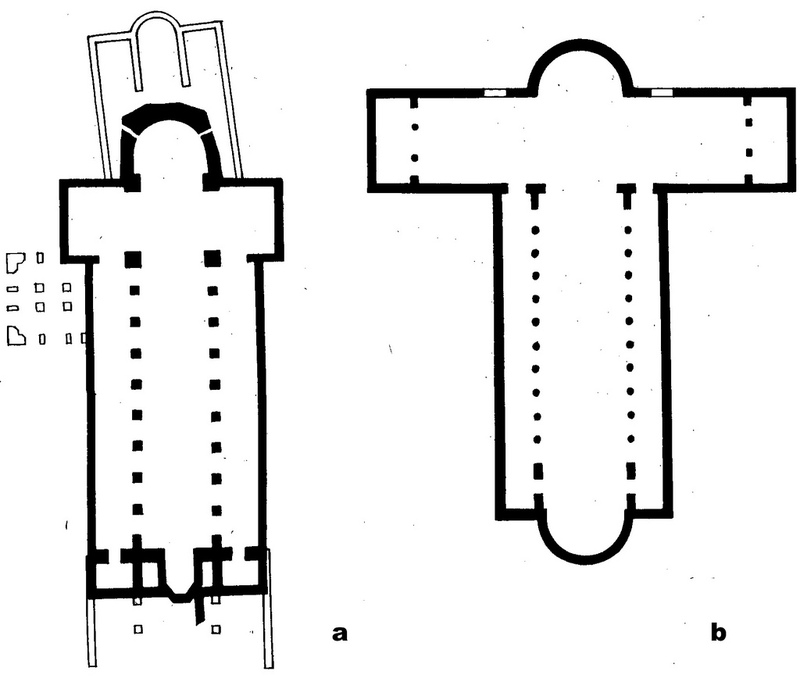 239 – The ground plans of the Saint Denis in Paris (a), consecrated in 775 AD and the (original) abbey church of Fulda (Germany) (b), which was finished in 819, show a tendency to extend the basic form of a basilica with transepts (to form a cross). A specific development within the basilica type churches is known as the Longitudinal-bauten or Hallenkirche (‘Hall Church’) in Germany. The ideal ground plan is quadratic, and the building is almost as wide as it is tall. The aisles and transept are about the same height as the nave, giving the structure an airy, boxy look. The Gothic Hallenkirche developed as early as the twelfth century, but reached its zenith in the fourteenth century, particularly in Westphalia. The Elisabethkirche in Marburg is probably the best example of an early Hallenkirche (fig. 240). Fig. 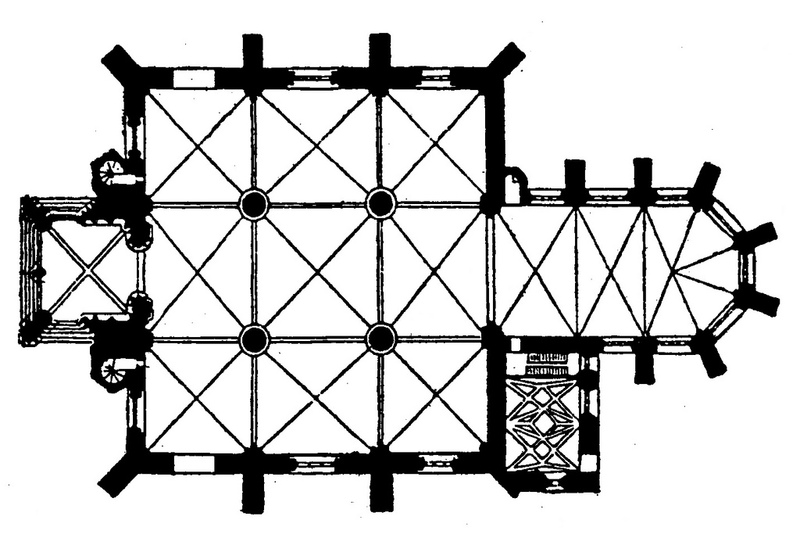 240 – A plan of the Elisabeth Church in Marburg (Germany). The building started in 1235, the east choir dated from around 1249 and the transept (Vierung) from around 1285. The German art historian Otto von SIMSON (1993; pp. 128 – 129) read in the architecture of the church a manifestatio based on the square (1: 1) and the proportion 1 : 2, points to an association with the octave in music. Other examples can be found in the Petrikirche in Dortmund, the Wiesenkirche in Soest and the Lambertkirche in Münster. The Frauenkirche (Church of Our Lady) on the Main Market in Nuremberg (Northern Bavaria, Germany) was started in 1354 and probably built on the foundations of an old synagogue (since the former Jewish ghetto was destroyed in 1349). The church was the first hall-church of the Franks and founded by Charles IV, who held his seat as the Holy Roman Emperor in Nuremberg. The Frauenkirche, with its additions, the Renaissance clockwork (1506 – 1509) and restoration after the Second World War, is now regarded as one of the major Gothic monuments in Germany. 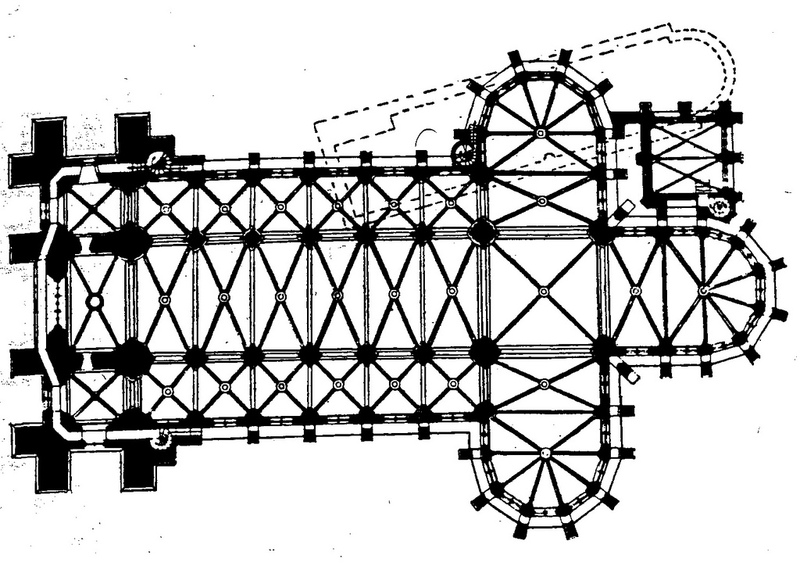 The ground plan of the Frauenkirche indicates a combination of three- and four-fold features (fig. 241), which reflects the various (division) ideas during its building history. The church exhibits an ‘organic’ generation, with distinct points in time. The appreciation of the church in modern (quadralectic) terms finds inspiration in the Fourth Quadrant, being a reflection of the earlier (three) phases of division thinking, including the unity of the hall-church and the square form of the later additions. Fig. 241 – The ground plan of the Frauenkirche in Nürnberg (Germany) is a combination of a cathedral-like apse with a superimposed square, divided in 3 x 3 compartments. The western facade, where the figure of Emperor Karl IV parades with his seven Counts (‘Männleinlaufen’), is a Gothic contraption, which adds to the potpourri-style of the building. The Hauptmarkt (Main Market), in front of the church, is each year the venue of one of the oldest Christmas markets in Germany. The most easterly Hallenkirche in Europe is the late Gothic ‘Schwarze Kirche’ in Kronstadt (Brasov), Siebenbürgen/Rumenia. The church dated from the fourteenth century, although an earlier version, found during excavations in 1937, can be traced back to the second half of the thirteenth century. Kronstadt became a wealthy place in the middle of the fourteenth century at the borders of Medieval Europe and at the fringes of the sphere of influence of the Roman Catholic Church. The church is about ninety meters long, twenty-five to thirty-seven meters wide and the roof is forty-two meters high. The size of the Schwartze Kirche could be explained as a means to impress any foreigner of another creed or religion. The building got its name, because it was burned down in 1689 and left in ruins for a long time. The Schwarze Kirche (Black Church) is typified by Gernot NUSSBÄCHER (1977) as the ’largest cultural building between the Stephansdom (in Wien) and the Hagia Sophia in Con-stantinople’. The Benedictine abbey church in Fulda (Hessen, Germany) is one of the oldest basilica type churches of Germany (fig. 239b). The monastery was founded in 744 by Saint Sturm, a disciple of Saint Boniface. The place grew in importance when the grave of St Boniface was established in the church. The Saint (originally called Winfrid) made a brilliant career in the Roman Catholic Church, but was murdered in 754 AD near Dokkum (Friesland) at the age of seventy-four in his zeal to convert the Frisians. It was said that he held a bloodstained copy of St. Ambrose’s book on the ‘Advantage of Death’ in his hand when he was beaten to death. The eighth-century basilica, which was erected in Fulda, soon became too small and had to be rebuild to house the crowds. This task took nearly thirty years (from 790 – 819) and the plan was based on the (old) basilica of Saint Peter’s in Rome. The new basilica, consecrated in 819, was, at the time, the largest church north of the Alps. Its most conspicuous features were the large transepts, pointing to a desire of the architect to compare the ground plan with a (Latin, or rather a Tau) cross (fig. 239b). The scholar Rhabanus Maurus (784 – 856), also called the ‘Teacher of Germany’ (Praeceptor Germaniae), was abbot in Fulda from 822 to 842. He became known from his ‘De Institutione Clericorum’ (On the formation of the Clergy, in three books) and his encyclopedic work ‘De Universo’, a twenty-two part compendium ‘On Everything’. Both works had a most decisive influence on the intellectual development in the Middle Ages. The former as a manual of German education and the latter as a storehouse of general knowledge, which could be used to religious advantage. Johann Dietzenhoeffer designed the present Fulda Cathedral in 1704 in a Baroque style, which distracted the attention from the original features. The remains of Saint Boniface stayed in the crypt (of the original abbey church) behind the high altar, although his skull is now in the Cathedral Museum. It is interesting to note, that St Michael’s Church, also in Fulda and built in the ninth century, had a parallel history, but favored the round model of the Church of the Holy Sepulchre in Jerusalem. The situation in Fulda suggests that the ground plan reflected an open mind towards its symbolic meaning at the time. Both examples were derived from the Holy Land, more than two hundred years before the Crusades, and could exist side by side. The circular or Anastasis-type pointed to unity and the basilica-type, with an extension to the cross, aimed at an enclosure of diversity. The Christian church builders of Middle and Northern Europe searched at the beginning of European visibility (750 AD) for examples to express their newly acquired faith in an authentic way, opposed to the Celtic ideas of the heathens. Any knowledge of Christian ‘roots’, as preserved in the building spree of Emperor Constantine in the fourth century was welcome. The achievements of his followers in countries like Syria, Palestine and Armenia in the fifth and sixth century was also helpful. The architects could fall back on the basilica tradition of the Christians – with its source in Roman history – and the devotion to the cross, as promoted by Constantine the Great. The basilicas of the late fourth century, like St. Peter’s Basilica, Santa Sabina, St. John Lateran and St. Paul-outside-the Walls in Rome, put an unmistakable mark on early Christian architecture. 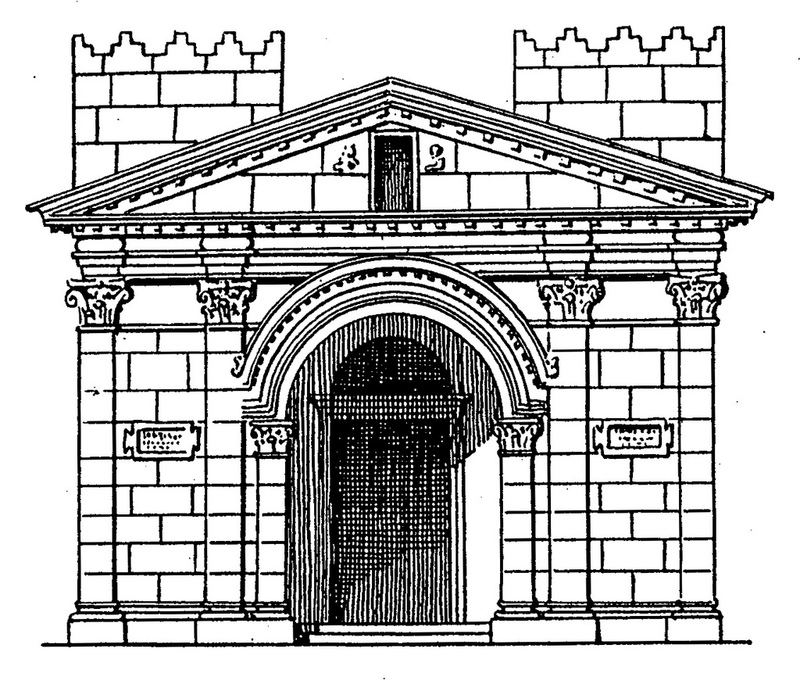 The San Clemente, also in Rome, continued the basilica design in the sixth century. Gregory of Nazianzen (c. 329 – 390) was probably the first church official, around 380 AD, to point out in words the resemblance of the Church of the Holy Apostles in Constantinople to a cross. The basilica of the Twelve Apostles in Constantinople was built by Constantine. It had a large cross-shaped ‘heroon’ intended for his own burial (but not yet finished when the emperor died in 337 in Nicomedia). Twelve empty caskets were prepared to receive the relics of the Twelve Apostles. Some, like Eusebius, described the original church as a large building with porticos along the four sites. Others, like Pseudo-Codinus, outlined the building as a basilica with a timber roof. A poem, allegedly composed by Gregory the Theologian, indicated a cruciform plan. We will never know the outlay of the ground plan, because the historical building perished and was rebuilt by Justinian (or Empress Theodora) and subsequently consecrated in June 550 AD. It is known that the new Church of the Holy Apostles, designed by the famous architects Anthemius of Tralles and Isidorus of Miletus, had the ground plan of a Greek cross. Four domes covered the four arms and a central dome was positioned on the intersection. Renovations of the magnificent building, only second in splendor to the Hagia Sophia Church, followed in the latter half of the ninth century by Emperor Basil I (867 – 886). Subsequently, the building was looted in the Fourth Crusade in 1204, but restored again in the early thirteenth century by Andonicus II Palae-ologus (1282 – 1328). However, none of these efforts had a lasting influence, because the church was dilapidated even before the Fall of Constantinople (1453). Mehmet II demolished the church in 1461 and initiated, in 1470, the building of the Faith or Fatih Camii (Mosque of the Conqueror). Some researchers believe that the mosque was built on the foundations of the Church of the Holy Apostles. This sorrowful story of just one church shows the fragmented history of the cross and rectangle ground plan throughout the ages. The plan could have been either way in the fourth century (basilica or cross), then it followed the Greek cross in the sixth century. The situation in Germany in the eighth century AD with respect to the symbolism of the circular and square is similar to the circumstances in Constantinople in the fourth century: both graphic expressions of the ground plan could exist side-by-side and none was superior to the other. The Benedict monastery in Fulda, being a reflection of a youthful and militant Christianity, could embrace the circular design of the St. Michael’s Church, copied from the Anastasis in Jerusalem, in just the same way as the Hallen-type of the original basilica, which was taken from the St Peter basilica in Rome. This tolerance towards other types of division thinking can be explained, if the positions on the CF-graphs of the Roman and the European cultural history are compared. The Roman Empire entered, in 375 AD, into the last stage of its visible invisibility (375 – 500 AD) with a CF-value of 11 (fig. 88). The European culture, on the other hand, just took up its period of visible visibility (750 – 900), also with a CF-value of 11 (fig. 267). The CF-value of 11 was chosen as a boundary between the empirical visible and invisible. So when a communication is characterized by this value over a longer period, like it occurs in the Second and Fourth Quadrant, then the sense of visibility can go either way. It results in a form of curiosity, eagerness, openness and tolerance. This observation has psychological implications as well. Tolerance is not only a moral value, given to some mental balancing act between opposites, but is also a mental choice/necessity, resulting from a certain position in a communication. The boundary of visible visibility (CF = 11) is a point of reference in any human relationship. Tolerance has close ties with the identity of a person. The latter is a Third Quadrant quality, which consists of a consciousness of boundaries. The threatening of these boundaries by external sources requires adaption. The most effective way to cope with the jeopardizing forces on the existing boundaries is a broadening of division thinking, allowing the peculiarities of other identities to blend in a wider view. Aim for CF = 11. If such a step is not or cannot be taken, then the communication remains in the realms of lower division thinking where any change will be regarded as a threat, which can only be counteracted by zero-tolerance, the language of the Third Quadrant itself.